If you're interested in multiplayer Mass Effect 3, you better buy the game new - or be ready to pony up extra for an Online Pass. We got most of the lowdown on the new multiplayer component of Mass Effect 3 a few days ago but one point that wasn't touched on was whether or not Electronic Arts would tie it in to its Online Pass program. This probably isn't going to come as a huge surprise to anyone but the short answer to that question is, yes. "The Mass Effect 3: Galaxy at War feature can be activated via the Online Pass code found in every new copy of Mass Effect 3," EA said in a press release. "The Mass Effect 3 Online Pass can also be purchased separately on the Xbox 360 videogame and entertainment system and PlayStation3 computer entertainment system." Before you go rummaging around for your torch and pitchfork, bear in mind that this isn't just unsurprising, it's also nothing new. Mass Effect 2 didn't support multiplayer but it did connect the Cerberus Network and all its groovy goodies to a single-use code included with new copies of the game, which is a less "rolls off the tongue" way of saying Online Pass. In other words, EA is just adding more stuff to a system that was established in the previous game. Now if you still want to take up torches and pitchforks, knock yourself out. I just want to be sure that nobody's operating from a position of ignorance. 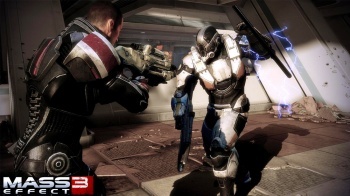 Mass Effect 3 comes out on March 6, 2012, for the Xbox 360, PlayStation 3 and PC. Thanks to RedEyesBlackGamer for the tip.